On Malibu's prestigious Point Dume bluff top, this mid-century Ranch-style home w/contemporary interiors is located on a quiet cul-de-sac road w/beach access. Unstoppable 180º ocean views from every rm & wood flrs throughout features a huge great rm w/flr to ceiling glass windows w/high ceilings & wd burning FP. The dining area & gourmet kitchen of Caesarstone countertops is tied into the open floor plan. A wraparound wd deck & boardwalk lead to a cliffside lounge deck surrounded by a grassy lawn & drought tolerant low water consumption landscaping. The home offers a sun-filled owner's suite w/corner glass sliders & a luxe bath as well as a 2nd bdrm & separate GR w/private entrance. The front yard has a bocce ball court & a free-standing air-conditioned private office. The exterior architectural polycarbonate awnings block 90% of suns UV rays & decreases the heat index for comfortable outdoor living year round. Full site security includes laser beam technology & full camera coverage. Lot Size: 1.01 Acres / 44018 Sq. Ft. Directions:Pacific Coast Highway to Heathercliff Road to Right on Dume Drive to Left on Cliffside Drive to Address. SchoolsClick map icons below to view information for schools near 28868 Cliffside Drive Malibu, CA 90265. Home for sale at 28868 Cliffside Drive Malibu, CA 90265. 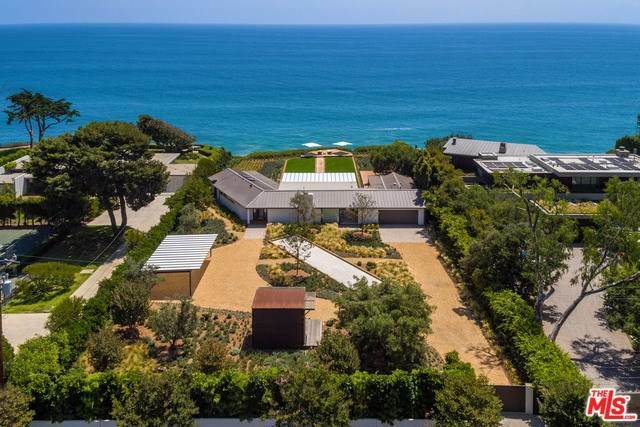 Description: The home at 28868 Cliffside Drive Malibu, CA 90265 with the MLS Number 19431716 is currently listed at $21,750,000 and has been on the Malibu market for 71 days. You are viewing the MLS property details of the home for sale at 28868 Cliffside Drive Malibu, CA 90265, which includes 3 bedrooms, 3 bathrooms and has approximately 2273 sq.ft. of living area.